The Missive Maven: Happy Hanu-Kat 2011! 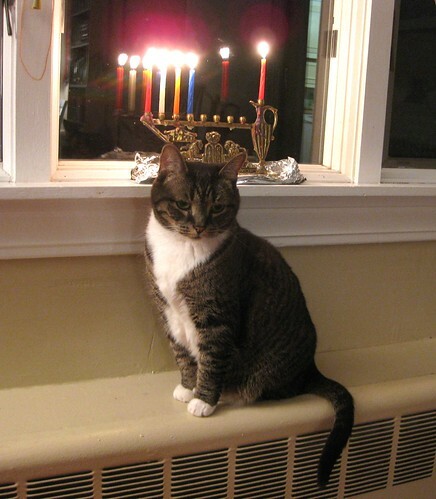 As you may have seen in years past, our shy kitty Magic is very fond of the Hanukkah menorah. 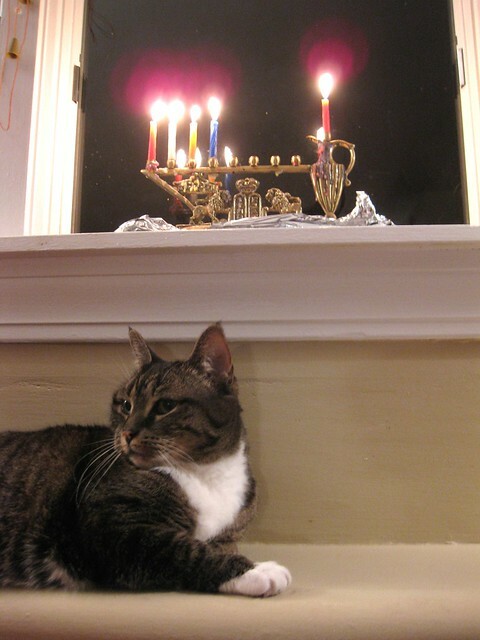 She and I both wish all of our Jewish blog readers a Happy Hanukkah (this was from last night's candles, but she's sitting by 'em again tonight! ), and a happy holiday season to everyone. oooo - she is SO PRETTY! Have a wonderful Holiday!! Thanks! Happy Hanukkah to you as well! She seems to be waiting for a little Hanu-Kat gift. Happy Hanukkah. Happy belated Hanukkah!Your cat is adorable and I love that your menorah's shammes is a pitcher-- symbolically using oil without the mess! Sweet! Love that the kitty loves the light/warmth. Happy New Year, by the way.